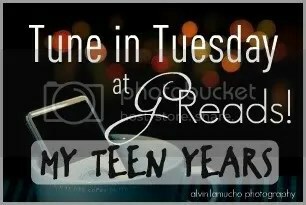 2000-2001 [Tune in Tuesday] – my books. my life. Check out the other Tune in Tuesday posts over at GReads! *** We’ve arrived. Senior year. I can remember this soundtrack clearly. And look, I finally got my hair under control. Also, I pretty much look exactly the same today. What were you listening to your senior year of high school? Nelly! You were finishing high school as I was entering my sophomore year of college. These songs bring back some really good memories, hahaha. And yay for the hair! I love Fallin’ by Alicia Keys! And the Lifehouse song is great! I used to love Nelly, and had his album. It’s weird because I just mentioned him in conversation the other day with one of my best friends, and now I see him here. Strange coincidence! Hahaha, Nelly. I really miss all the music from a decade ago. So much better than the crap that’s on the radio now, I hate this weird new trend of super-pop, techno-y, R&B and rap blend. Awww you’re so little and cute in your senior pic!! The Lifehouse song and the Alicia Keys one (she’s my fave singer!!) seriously transport me back to that year!!! Both those songs actually remind me of my first year of college/first year living on my own… but I remember they played that Lifehouse song over and over at Grad Night at Disney that year. I still loooove those songs, LOL. Another word (or three): Total teenage angst.